Allen Ezail Iverson was born on 7th June, 1975 in Hampton, Virginia, USA. He is a former professional basketball player who played in the positions of shooting guard and point guard. As well as many victories in the NBA league, Allen was in the USA men’s basketball team which represented his country in the Athens Olympic Games 2004, where they won bronze medal. Iverson played basketball professionally from 1996 until his official retirement in 2013. How rich is Allen Iverson? Well, currently the net worth of the retired basketball player is in negative figures, -$1 million. Allen Iverson went bankrupt when his estimated expenditure exceeded his income by at least a few times. During all the years he played professionally, Iverson earned at least $155 million. More, he added more than $30 million from various endorsements with popular companies. However, his luxurious lifestyle was way more expensive than he managed to earn, reaching the point where his monthly expenses reached $360,000 whereas his income was only $62,500. Allen Iverson was raised by a single mother in Hampton which was an exceptionally shabby and crime-ridden district. Residents of Hampton used to say that only fools can hope to achieve something in life and get out of poverty. Seven of his friends were shot dead in a few years, but Allen was positively distracted from troubles while playing basketball. After graduation from high school, he received a scholarship to Georgetown University, and became a major player in the basketball team. The first year he was recognized as the best defender and best defensive basketball player, and then managed to play even better during his second year. After two seasons, he decided to take part in the NBA basketball draft OF 1996, in which he was chosen in the first round, first pick overall by the Philadelphia 76ers club. He successfully played in this team until 2006. Then the basketball player was voluntarily exchanged to the Denver Nuggets team. In 2008, Allen was traded again, to the Detroit Pistons team. In 2009 he signed a one-year contract with the Memphis Grizzlies club. 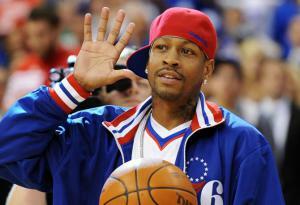 However, it was reported that the team decided to part with Iverson. Of course, all contracts in the NBA involve considerable money, and Allen Iverson’s were no exception. The same year he decided to terminate his professional basketball career, however, several months later the Philadelphia 76ers announced that an agreement with the basketball player had been signed. Then in 2010 the team announced that Allen Iverson would not return to the team because of personal problems in the family. Despite this fact, Allen surprised basketball fans and announced signing a two-year contract worth $4 million with Istanbul’s Besiktas club, which played in the European Cup tournament. Allen played three matches, collected an average 9.3 points and 3 assists per game, but suffered an injury and went back to USA for medical treatment. In 2011 Iverson has been recognized as one of the all-time best offensive defenders. In 2013 Allen Iverson officially retired from professional sport. In 2000, Allen released the single “40 Bars”. Due to the criticism he has decided not to continue his career as a musician. In 2001, Iverson married Tawanna Turner, however, they divorced in 2013. Allen has fathered five children. 1 How do I help my teammates by practice? 1 Professional basketball player with the NBA's Philadelphia 76ers (1996-2006; 2009-1010[end]), Denver Nuggets (2006-2008), Detroit Pistons (2008-2009), and Memphis Grizzlies (2009-2010[start; played 3 games]). Played the 2010-2011 season in Turkey. 2 Inducted into the Naismith Memorial Basketball Hall of Fame in 2016. 7 He and wife Tawanna welcomed their fourth child, daughter Messiah Lauren Iverson on August 16, 2005 at 11:47 AM, weighing 6 lbs, 12 ounces. 8 Olympic Bronze Medalist (2004 - Basketball). 9 Allen's third child, son Isaiah Rahsaan, was named for Isiah Thomas and the late Rahsaan Langford, Allen Iverson's close friend who was shot to death in October 2001. 10 He founded the Crossover Foundation. 11 Wife Tawanna, gave birth to their 3rd child, Isaiah Rahsaan Iverson, the baby weighted 7 lbs. and was born at 9:30 A.M. on August 8, 2003. 12 Lives on the same street as M. Night Shyamalan. 13 Since 1998, he has hosted the Allen Iverson Celebrity Classic to benefit the Boys & Girls Club of Greater Hampton Roads, Virginia. 14 Named after his father, Allen Broughton, who left the family and never married Iverson's mother. 15 Georgetown University's all-time leading scorer. 16 Released a rap album, Slow Motion, with appearances by his friends Ma$e, Jermaine Dupri, Da Brat and Kool-G-Rap. 17 Led the Bethel High School Bruins (Hampton, Virginia) to the 1993 basketball and football state championship; the then-16 year old played point guard and quarterback. 18 Daughter Tiaura (b. 1995), son Allen II, or "Deuce" (b. 1998). 19 Under lifetime contract with Reebok. 20 Played Quarterback in HS and led his school to state titles in football and basketball his junior year. 21 Played for Georgetown University. 22 In 2001, Led the 76ers to their first NBA Finals appearance since 1983 (lost to the LA Lakers in 5 games). 23 All NBA First Team 1999, 2000, 2001. 25 All Star Game MVP 2001. 26 NBA All Star 2000, 2001, 2002. 27 Rookie All-star game MVP in 1997. 28 Rookie of the Year 1997. 29 Drafted first overall by the Philadelphia 76ers in 96. 30 Attended Georgetown University from 1994 to 1996 where he was coached by the legendary John Thompson. 31 Was named MVP of the 2000-2001 NBA season.